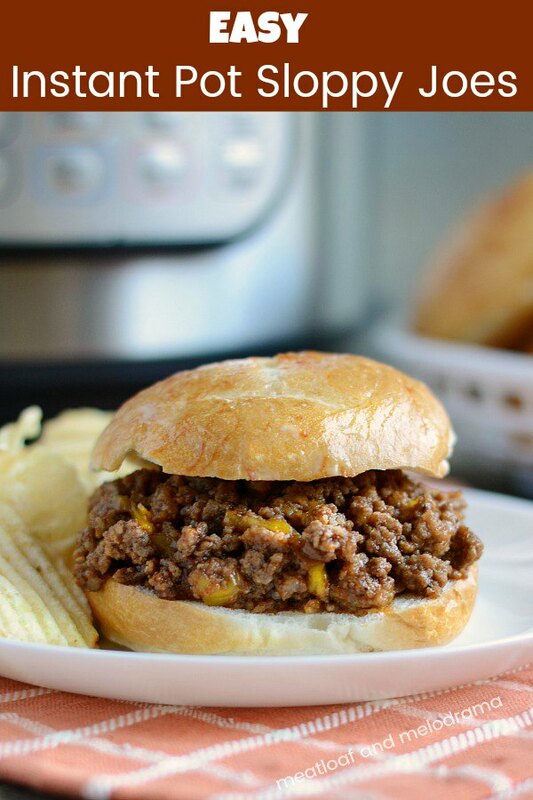 This Instant Pot Sloppy Joes recipe is made with ground beef and a few other simple ingredients. It’s a quick and easy dinner that’s kid approved! 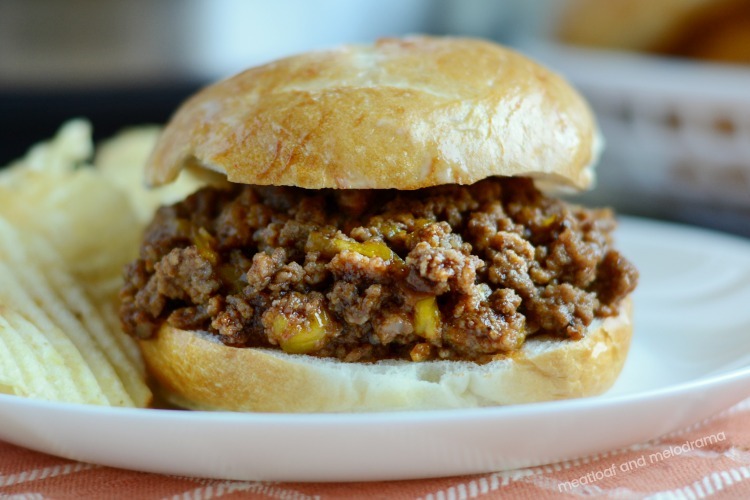 Sloppy joes are one of my family’s favorite Instant Pot recipes. 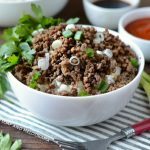 Actually, they’re one of our favorite ground beef recipes if not one of our favorite easy dinner recipes — period! 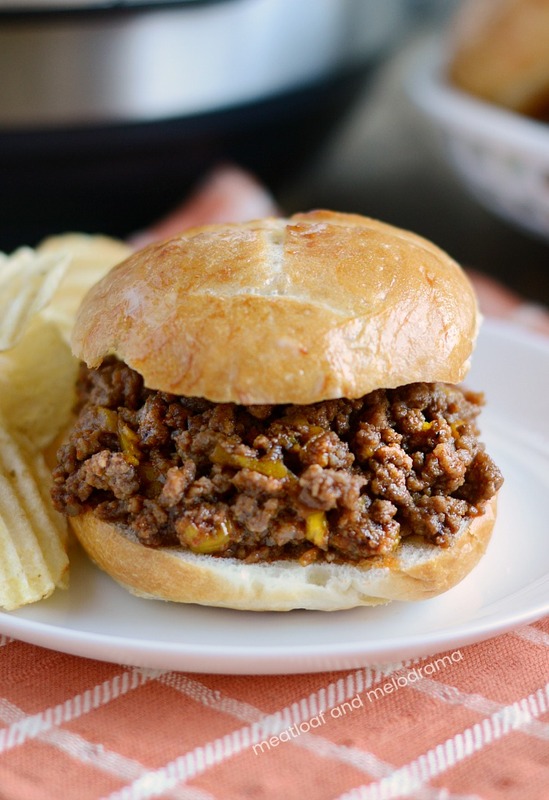 Did you grow up eating sloppy joes? I did, but my mom made them on the stove with a can of sauce mix — a Manwich! I think everyone ate those back in the day. I’ve been making homemade sloppy joes forever. It’s really easy and not much more work than opening a can. Plus, you can control the sodium and other ingredients and customize the recipe to taste how you like it. Since I love experimenting in the kitchen, I decided to to try making sloppy joes in the pressure cooker. It’s actually a little easier this way since you don’t have to stand over a stove. And, I love the softer texture! So, this is like an Instant Pot Manwich. 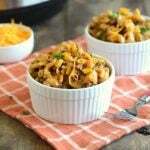 My family actually prefers the Instant Pot recipe over the stove top one, and even my picky eaters love it! Pressure cooker sloppy joes start out looking a lot like Instant Pot chili. You start out by browning the hamburger meat and draining it. Then, you add the spices, onions and diced bell pepper. Most people use green bell peppers, but I like the pop of color you get from yellow bell peppers. Just use whatever you have on hand. Next, add some tomato sauce, brown sugar and a little bit of mustard. I use Dijon mustard, but again, you can use what you have. 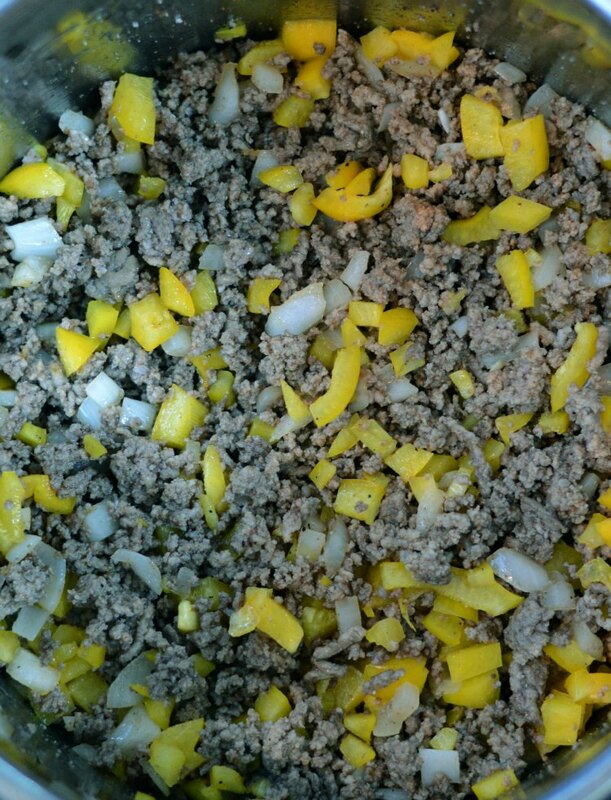 Pour in a little bit of water, and pressure cook the hamburger meat mixture for 10 minutes. Do a quick release or a gradual quick release, and then stir the mixture once the pressure is fully released. At this point, the mixture will still have some liquid, so I like to hit the Saute button and let it bubble away for about 5 minutes. I also like to chant “Double, double, toil and trouble” while the liquid is reducing, but this is completely optional! Once the sloppy joe meat is nice and thick, turn the pot off, and toast your buns. This is also optional, but I just hate soggy buns! Load the meat onto the buns, and that’s it. We like to add cheese to our sloppy joes before serving, but you can also eat them plain — It’s up to you! 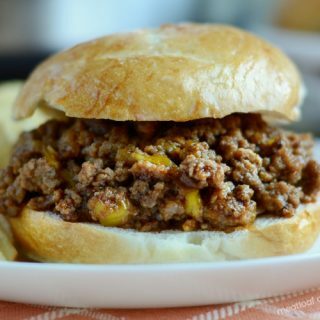 This Instant Pot Sloppy Joes recipe is made with ground beef and a few other simple ingredients in the pressure cooker. 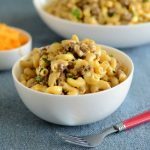 It's a quick and easy dinner that's kid approved and perfect for families! Cook beef until no longer pink, and press Cancel to turn off and remove excess grease, if necessary. Press Saute again, then stir in sea salt, pepper, garlic powder, paprika and onions, and cook until onions are slightly soft. Stir in diced bell pepper, then hit Cancel again. Make sure no meat is stuck to bottom of pot. You may have to add a little water to deglaze, if it is. 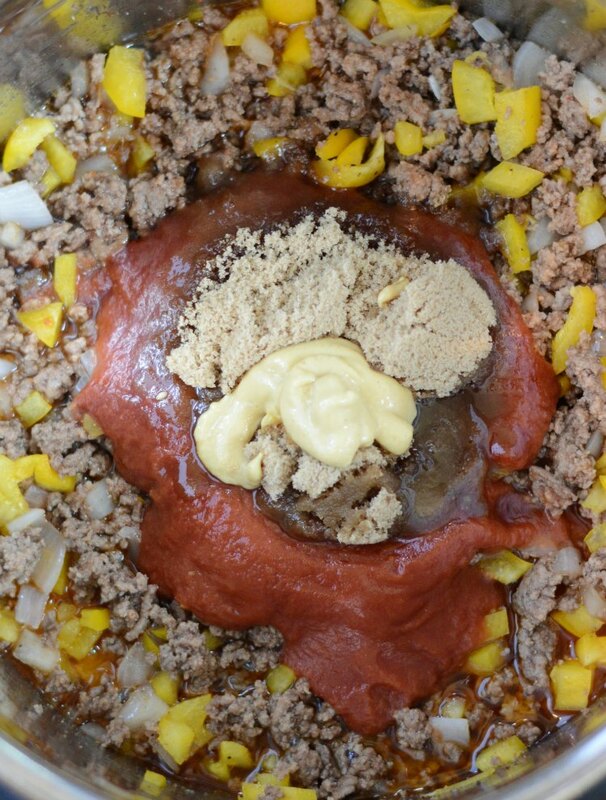 Add the tomato sauce, brown sugar and mustard over the meat mixture, but do not stir together. Pour water around the sides of the meat. Cover with lid, set valve to Sealing position, and hit PRESSURE COOK for 10 minutes. After cook time, do a gradual quick release -- gradually turn the valve to the left to release pressure. When pressure is fully released, and pin drops, open lid, and stir. Hit Cancel to turn pot off, then hit Saute and cook for about 5 minutes to reduce extra liquid, stirring occasionally. Hit Cancel to turn pot off, and allow meat to cool slightly. Then serve on toasted buns. Recipe was made in a 6-quart Instant Pot electric pressure cooker. I hope you enjoy these easy Instant Pot Sloppy Joes as much as we do! Adding this to our meal plan for next week!! I will be making these this week! Amazing recipe! Thanks so much, Amanda. I hope you like them! These Instant Pots are so handy!! It is becoming my go to kitchen appliance! These looks so great! This is the easiest weeknight dinner! I love it! This is a must-make!! Love how easy it is! Such a great, family friendly meal! So easy in the Instant Pot! We found a new family favorite. Made this tonight. It looks delicious and really easy to make!! Just pinned your awesome recipe! Thanks so much for sharing with us at Full Plate Thursday and sure hope you have a great week! I think these were the best sloppy joes I’ve ever made! That’s wonderful, Diana — thanks! So glad you liked it!